I'm going to say it's been a good and productive week. I do feel the pressure of fall coming on with shows and exhibitions on the horizon. I'm looking forward t getting some pots out there in the world. The summer has been fairly slow as far as sales go. I am thankful of the orders I've had from galleries and some sales on Etsy. I do want to get my online shop stocked up for my customers who live far away. 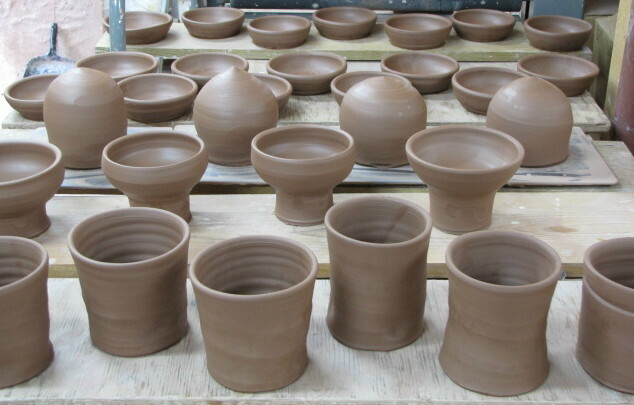 Here's the output for today, some small bowls, mugs, tall footed bowls that will be chickens, and a few bigger tall footed dishes. I found out this week that I had two cups selected for the 2nd Annual National Cup show hosted by Barrett Clay Works in Poughkeepsie, NY. I'll have some pics of new pots out of the kiln up tomorrow. Hope ya'll have a good evening.